For admission to all the Integrated First Degree Programmes except B.Pharm. candidates should have passed the 12th class examination of 10+2 system from a recognized Central or State board or its equivalent with Physics, Chemistry, and Mathematics and adequate proficiency in English. For admission to B.Pharm., candidates should have passed the 12th examination of 10+2 system from a recognized Central or State board or its equivalent with Physics, Chemistry, and Biology or Mathematics and adequate proficiency in English. Students who are appearing for 12th class examination in 2016 or who have passed 12th Examination in 2015 only are eligible to appear in the BITSAT-2016 test. 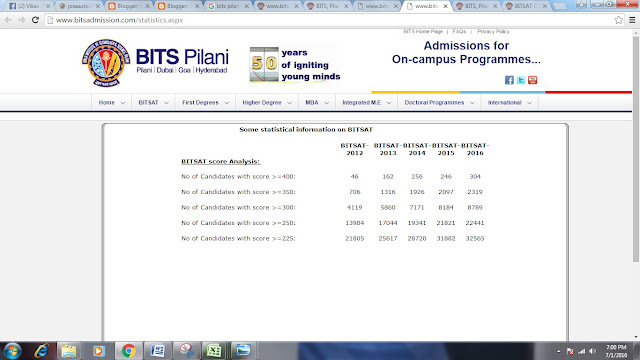 Students who have passed 12th examination in 2014 or earlier are NOT eligible to appear in BITSAT-2016. Students who are presently studying in BITS at any of its campuses are not eligible to appear in BITSAT-2016. Admissions will be made purely on merit. The merit position of the candidate for admission will be based on the score obtained by the candidate in the BITSAT-2016. However, their eligibility for admission is subject to fulfilling the requirement of minimum marks in 12th examination, as mentioned above. In the past, admission process of the Institute always ensured guaranteed admission to all the students who obtained first ranks in their respective board examinations. This has given a very vital input of highly meritorious students from all over India. Continuing this tradition, the Institute will give direct admission to first rank students of all the central and state boards to the programme of their choice, irrespective of their BITSAT-2016 score. While the first rank student in PCM stream will be considered for admission to any of the first degree programmes of his/her choice, the first rank holder of PCB stream will be considered for admission to B. Pharm. programme only. Moreover, they should have obtained the minimum marks in PCM/PCB SUBJECTS in 12th class examination, as described above. For more details, see the later sections in this part and also the BITS website. b) has obtained the highest aggregate percentage of marks in 12th class among all the students who have taken Physics, Chemistry, and Mathematics subjects in 2016 from the Board. For the purpose of calculating the aggregate percentage, the aggregate marks should include the marks of Physics, Chemistry, and Mathematics subjects in addition to other subjects which are required to pass the 12th class examination from the Board under consideration. Further, the Physics, Chemistry, Mathematics subject marks should be included in the aggregate, irrespective of whether the Physics, Chemistry, and Mathematics subjects are identified as main/optional/elective in his marksheet(s). In the case of first rank candidate of Physics, Chemistry, Biology stream, the criteria is same as above, replacing ‘Mathematics’ with ‘Biology’ subject in 12th standard. However the first rank holder of PCB stream will be considered for admission to B. Pharm. programme only. Candidates who are appearing in BITSAT 2016 need to apply through an online form giving Programme preferences and marks obtained in 12th class examination. The link for applying to first degree programmes will be made available on 23 May 2016. A. The following is the details of the fees for the Academic Year 2016-17 at BITS, Pilani- Pilani Campus . B. The following is the details of the fees For the Academic year 2016-17 at BITS, Pilani- K. K. Birla Goa Campus..
c. The following is the details of the fees For the Academic year 2016-17 at BITS, Pilani- Hyderabad Campus..
2.Vice-Chancellor may waive full or part of tuition fee to deserving Ph.D. candidates, who are not getting any fellowship or scholarship. 3. Subject to increase according to the nature of courses. 4. All fees are to be paid in advance. Only caution deposit and mess advance is refundable after adjustment of dues at the time of withdrawal from the Institute. This applies to prospective candidates who are seeking admission as well as ongoing students of the Institute. 6. Every year 24% of students admitted to First Degree Programs get between 25% to 80% tuition fee waivers in form of different scholarships. 7. Students admitted to the Higher Degree Programs may be considered for Teaching Assistantships with stipend upto Rs. 11200/- per month and/or partial tuition fee waiver. 8. Students admitted to the Full time PhD program will be considered for Project/Research assistantship to the tune of Rs.13200 to Rs. 18200 per month. (1) The above are for a normal situation. Wherever a student's programme gets modified or his progress is delayed beyond the maximum permissible, such a student is advised to consult the appropriate authority before registration. (2) The fees and other charges are payable in advance in each semester/term on the notified dates before registration. No withdrawal from a course or courses will entitle a student for refund of fees. (3) Students who go for Practice School II will be charged semester fees and the summer term fees because the practice school is longer than a semester and extends it to summer. (4) Casual students will pay fees prescribed for regular students. (5) Institute caution deposits are refundable only at the time of withdrawal from the Institute. (6) If there are dues outstanding from a student, his grades will be withheld. (7) Students who accumulate mess arrears would be required to pay a prescribed additional advance at the time of next registration. (8) Refunds, if any, will be made through crossed cheques/Bank Drafts.